Now, this is a great life lesson people. Always wear undies, and you get bonus points for clean ones. 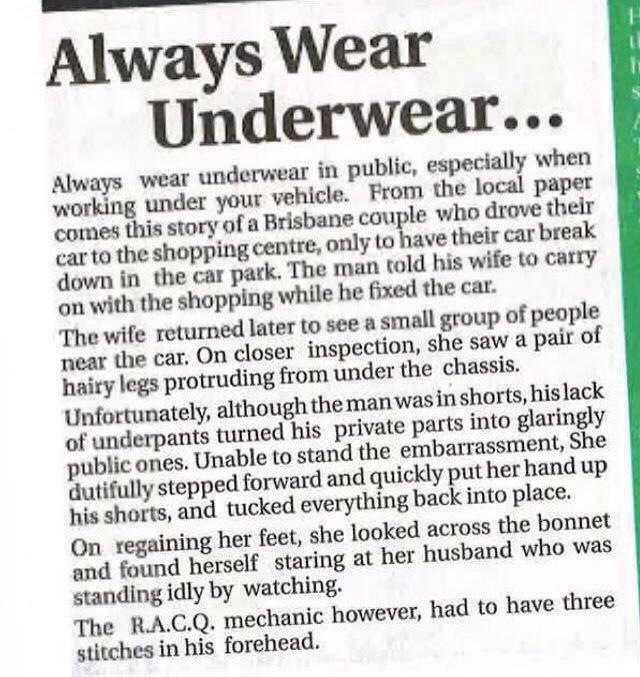 I really can’t confirm if this is a true story but is bloody hilarious. I must say, what a lovely, caring wife she was…was…I don’t think, even if her husbands bits have neon arrows and a name tag, she’ll be tucking them back in next time. Lets hope for everyones sake that there isn’t a next time. Next postHair Moose And A Fairy Tale. How she didn´t see that it isn´t her husbands? BWA HA! HA! HA! HA! HA! HA! HA! THAT is awesome!! !